The summer holidays have arrived! The boys and I love going out and about, but we are exhausted too so a few quiet mornings at home are also helpful for us. 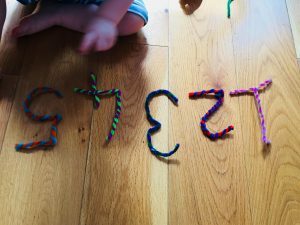 My toddler (22 months) is really interested in numbers, and loves pointing out all the numbers he knows. 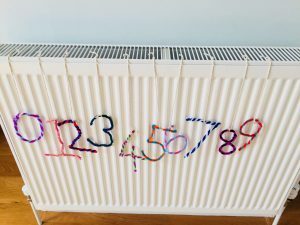 So I thought we would have some fun making some numbers out of pipe cleaners to then attach to the radiator. 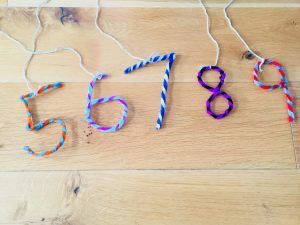 To make the numbers, I twisted two pipe cleaners of different colours together and then bent them into the desired shape. 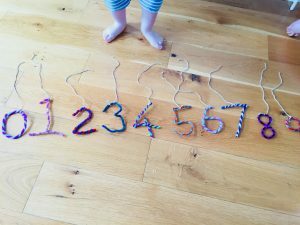 My toddler was really happy sitting on the floor telling me what number to do next. 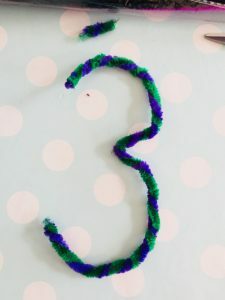 My preschooler had fun playing with pipe cleaners and scissors and making his own ‘creations’. 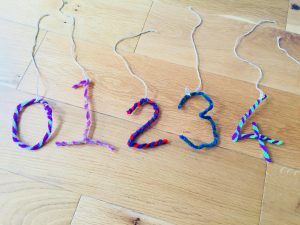 We made the numbers 0-9 (and discussed what colours we were using for each one), and my toddler liked picking them up and putting them in order (with some help!) and naming them. 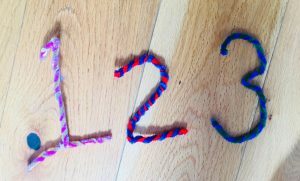 We then attached some string to each one and put them on the radiator. My toddler spent quite a while picking each one up and talking about them. I think he will enjoy coming back to them again and again! 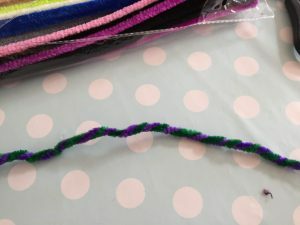 If you want to have a go, here are links to the supplies we used. Please note that these are affiliate links, which means that if you purchase the items here I get a small commission at no cost to you. Next story Oobleck – fun with slime! Previous story Home-made chemistry set!